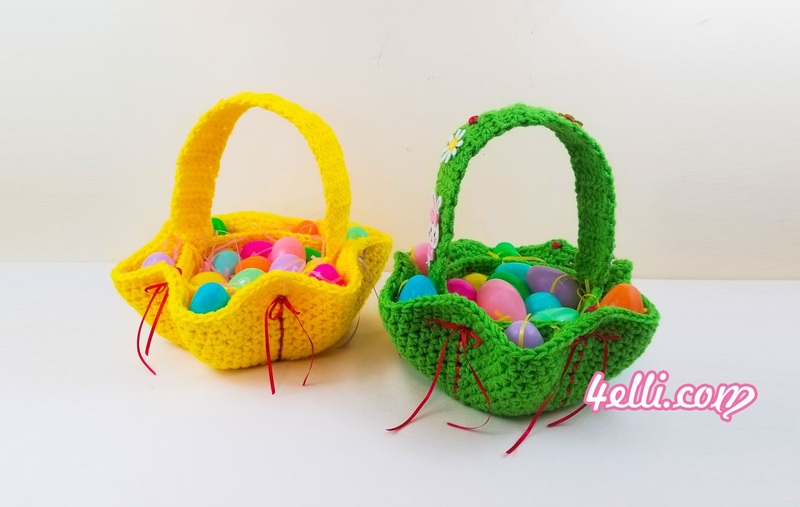 How to crochet Easter Egg Baskets!! with double yarn: chain 5, slip stitch to the 1st chain to form a ring, 18 hdc into the ring. Round 1: *1hdc in each of next 2 stitches, (1hdc, chain 2, 1hdc) all into the next stitch*, repeat from * to * around. * in the end you must have total 6 V-spaces around. Repeat round 2 until the piece measures 16 inches. when you have the size, 1sc into the 1st stitch, finish off. Flip over the piece, facing the wrong side, count 6 rounds from the beginning and mark the 7th. We going to work into the loops of round 7. Round 1: with a new yarn ball and double yarn, make a slip knot, place the slip knot into a loops and make a slip stitch to secure, 1hdc in each loop around. In the end of round 7: 1sc into the 1st stitch, finish off. Sew the V parts into the body. Watch my free video tutorial witch shows you how to make this beautiful easter egg basket step by step! This videos is also available for left hand!